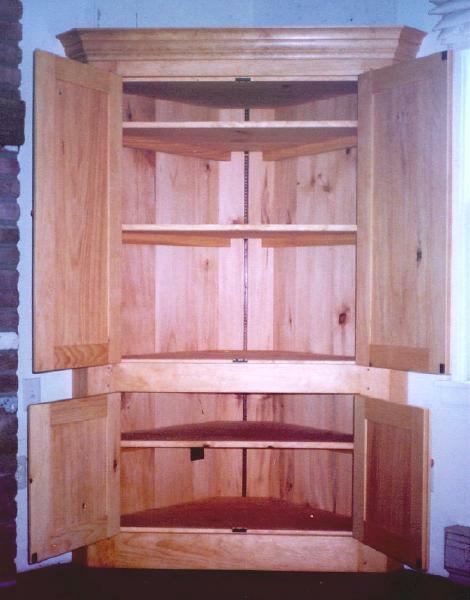 The following are examples of some of the Cupboards made by Falcon Woodworks. Our Cupboards are custom made to any size or style to meet your requirements. They can be made from a variety of hardwoods or pine and finished with a natural hand rubbed penetrating oil or painted. 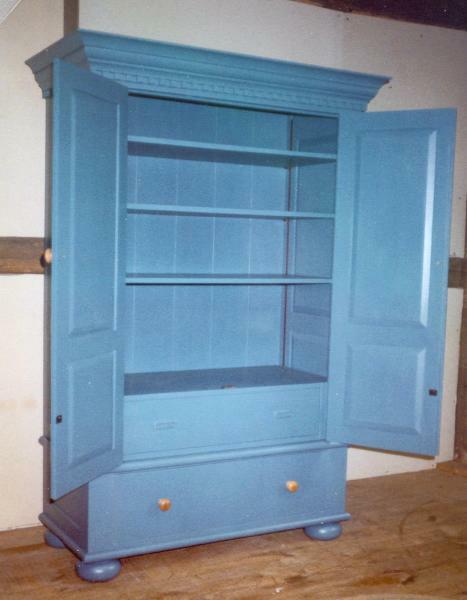 You may even choose a natural finish on the outside and painted on the inside. 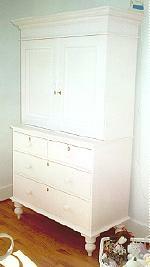 Painted Country Child's Armoire is only 68" high and designed specifically for a young lady's bedroom. It has 2 draws (one internal) and 3 shelves [Click for Image] and is topped with a bold crown molding. 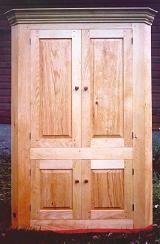 This cupboard is built from solid poplar and has raised side and door panels. The draws are dovetailed construction. Shown with hand turned bun feet. 68" high by 40" wide (plus crown molding) by 19" deep (plus crown molding). 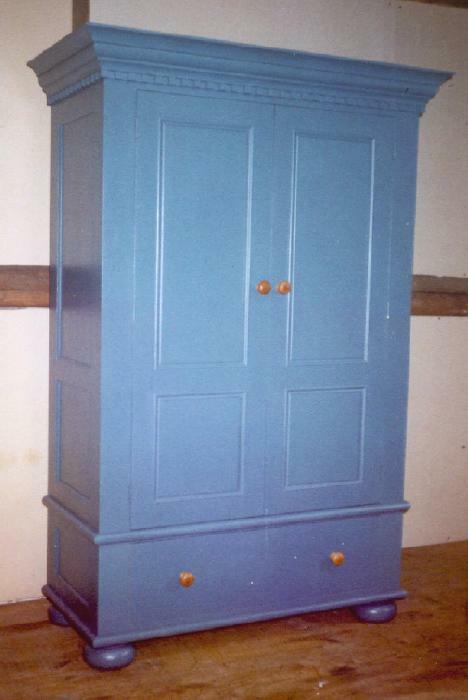 Painted Country Bathroom Cupboard. Built to store towels, linens, and other bathroom supplies. It has 3 moveable shelves in the top section and 2 in the bottom [Click for Image]. The door panels are raised on the interior and have a raised molding on the exterior. 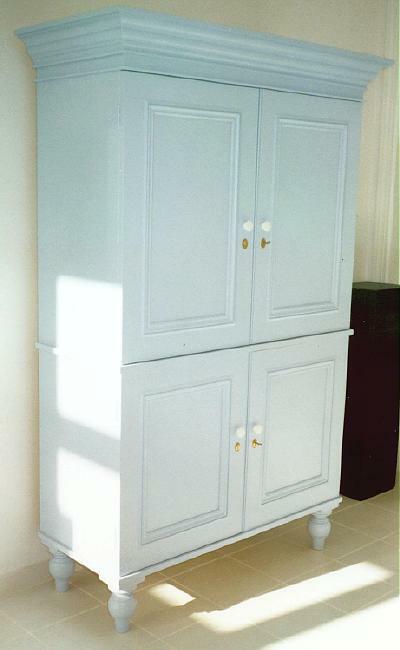 This magnificent cupboard is made in two section to make it easier to install and move if necessary and is topped with a custom crown molding. Shown with hand turned turnip shaped feet. 80" high by 46" (plus crown molding) wide by 20" deep (plus crown molding). 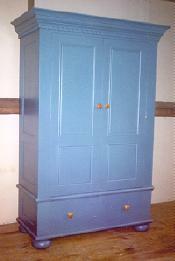 Painted Country Storage Cupboard. 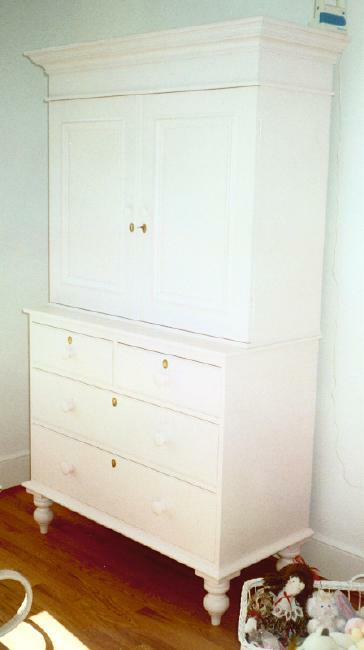 This stunning traditional piece of furniture with large crown molding may be used in a bedroom, hallway or other room for storing bed linens, towels, clothing, etc. 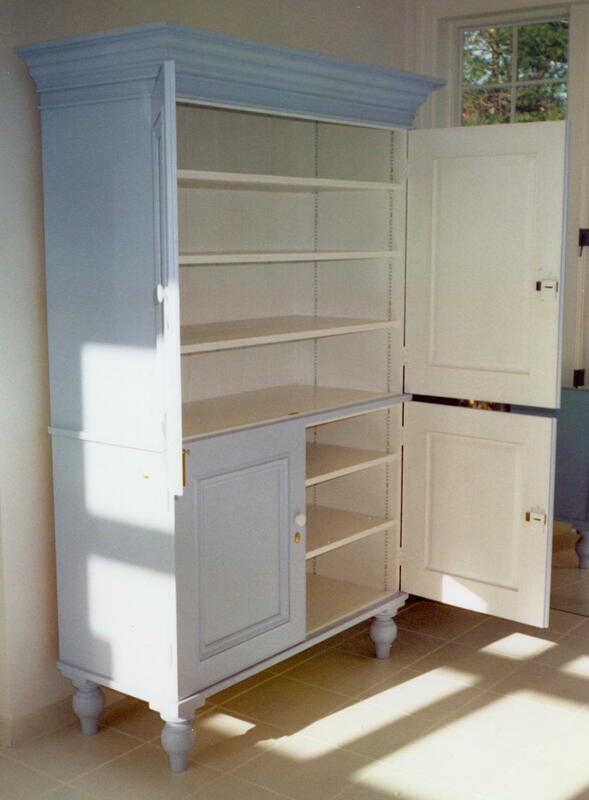 It is built from solid poplar has raised panel doors like the cupboard above and is fitted with dovetailed draws. Made in two section to make it easier to install and move if necessary. Shown with custom hand turned feet. 81" high by 44" wide (plus crown molding) by 20" deep (plus crown molding). Natural Pine Corner Cupboard designed as an entertainment center [Click for Interior] and built from cabinet grade pine. Made with traditional raised panel doors and classic bold crown molding. The cupboard has a hand rubbed natural penetrating oil finish. 75" high by 53" wide. 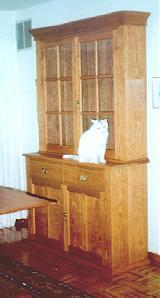 Cherry Hutch or Sideboard with glass doors and a bold crown molding. This piece has been built in two sections with 2 shelves in the top section and 2 draws and 1 shelf in the bottom. The draws, top and bottom cases are dovetailed construction with poplar secondary wood. This piece has a hand rubbed natural penetrating oil finish. 84" high by 48" wide by 17" Deep.